Please feel free to contribute a biography of any Netherwood. Personal recollections would be especially welcome. CHARLES WILLIAM NETHERWOOD of Wisconsin, USA, (not the same Charles William who appears on the home page) was a well-known Civil War veteran, pioneer political progressive and a prohibitionist. He was also known locally as a hiker, celebrating his 90th birthday by walking 14 miles from his home in Dane Co. to the capital city of Madison. Born in Watervliet, New York, 14 January 1843, he was the first child of Joseph and Emma (Barraclough) Netherwood of Fixby, West Riding of Yorkshire, England, who came to America after their marriage in March 1842. Joseph, a woollen spinner, readily found employment in the expanding textile industry of New York State but eventually took his family "out West" to Wisconsin. There he bought land from which he created one of Dane County's finest farms. "Charley" attended school at intervals from work on the farm. 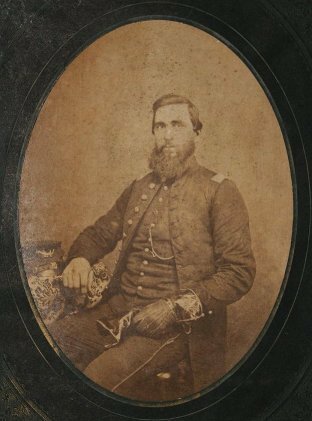 In August 1862 Charley enlisted in the 23rd Wisconsin Volunteer Infantry, serving in several states including Mississippi where he took part in the Vicksburg campaign. There at Champion's Hill on May 16, 1863, he was wounded by cannon shot which paralyzed him completely. Able to hear perfectly but unable to feel anything, he lay helpless while his companions and commander expressed their regrets and crossed his arms over his chest in anticipation of the burial squad. "I was frantic," he later said. "I could not even move an eyelid to show them I was alive...for an hour and a half I lay there expecting to be buried alive. Then suddenly I felt one finger. The rest of my body was completely numb. I began wiggling this finger and one of my comrades who had come to take another farewell look at me saw it move. 'Migod,' he yelled, 'Charley's alive.'" Charley remained with his Company although unable to fight. Within a few weeks he was wounded in the shoulder and jaw by gunfire and taken to a Memphis hospital. Part of his lower jaw was amputated and he was eventually sent home. As a civilian he attended a commercial college and attempted several professions, including broom-making, but his disabled arm and poor health interfered. Then in 1869 he received a commission as postmaster for the town of Oregon and kept that position until 1893. He became president of Oregon Manufacturing Company and builder and owner of the main business block, which included a prominent structure called Netherwood's Hall. He also served many terms as town treasurer and president and represented the town on the county board of supervisors. A teetotaller even in his younger days, he was instrumental in getting early legislation passed curtailing the sale of liquor. He was credited with starting Wisconsin Senator Robert LaFollette on his distinguished career by urging him to run for Dane Co. district attorney. Many years later, in recognition of his early adherence to progressive principles, he was given the honor of escorting Phillip LaFollette, the senator's son and governor-elect of Wisconsin, to his 1935 inaugural. In 1937, at age 94, he was initiated into the Shriners, having been a Mason 73 years. That same year he was made custodian of the Grand Army of the Republic's Memorial Hall at the state capitol. He died a year later, 4 Jul 1938, and is buried in Prairie Mound Cemetery, Oregon, Wisconsin. Charles Netherwood was a member of the Methodist church. He married three times, in 1866 to Eva Bedford who died only a year later, second to Lucy H. Gilbert nee Sayles, a widow with daughter Ada, and in 1922 to Mary Clementine Willoughby Breylinger, also a widow. He and Lucy had six children: Harry, Eva, Lucy, Pearl, Bertha and Perry. HENRY STONEY NETHERWOOD, a lifelong resident of Huddersfield, West Yorkshire, England, excelled in a number of roles during his lifetime -- soldier, rugby player, businessman, councillor, among them. He distinguished himself early in WWI, enlisting as a private in the Duke of Wellington's West Riding Regiment and becoming a second lieutenant in December 1914. The following April he entered the theater of war in France and later commanded a trench mortar battery for which he was made captain in January 1917. His participation earned him the Victory Medal, British War Medal and 1915 Star. During WWII he volunteered in the Royal Observer Corps, an aircraft-spotting service. In 1918 he joined Huddersfield Borough Rugby Club and remained a member for life, serving as president the year before his death. In his youth he was captain and president of Huddersfield Union Rugby Club, where speed and skill at changing pace soon advanced him to the Northern Rugby Union. He played for Yorkshire in 1919-20, gaining an England trial in 1921 but suffered an early injury. Another injury the following year caused him to relinquish his rugby career. He had been described as one of the finest wing threequarters the Huddersfield club had produced. In business, he was associated all his life with Netherwood, Dalton and Co., Ltd., of Bradley Mills, the printing firm founded by his father. At the time of his death he was managing director and a past president of Huddersfield Master Printers' Association. A political Independent, he was also a councillor for Denby Dale Urban District, an office he held for eleven years until his death. He had been chairman of the Council the year before, serving on the Barnsley West Riding Bench of magistrates. Born in 1894 to James Arthur and Edith (Armitage) Netherwood, Henry S. Netherwood was 63 when he died on September 23, 1957 en route to his home in High Flatts. His funeral at Park Wood Crematorium, Elland, was conducted by the vicar of Denby and attended by many notable public and business figures in addition to friends and family. He was survived by a widow and sons John, Richard and Jim.